Love is in the air! So many of my beautiful coupled-up friends have been tying the knot over the past year (always the bridesmaid and never the bride, woe is me, hint hint boyfriend…I promise I’m not crazy), and I’m running out of unique wedding and bridal gifts. I try to get something special and personal for gifts, but sometimes it’s hard. Two of my amazing friends are getting hitched this weekend in Story, Indiana and I wanted to give the bride something fun yet functional to take with her. After a little bit of research, I put together a bridal survival kit. No matter how prepared you are, something unexpected always comes up. Or maybe you were so busy stressing about the seating arrangements and first dance song that you forget to pack some floss. So I took some suggestions from others and put together this jar of survival goodies to help with the big day. I completed it by wrapping it with burlap and tagging it with the wedding date. Simple, easy to transport and packed full (seriously, once this thing gets unpacked, good luck getting it back in) of emergency essentials. (1) Bobby pins (2) Orbit gum (3) Q-tips (4) Hairspray (5) Lotion (6) Bandaids (7) Nail glue (8) Burts Bees chapstick (9) Colgate Wisps (10) Extra strength Tylenol (11) Tissues (12) Ponds makeup removing wipes (13) Floss (14) Vaseline (15) Mouthwash (16) Lint roller (17) Tide to-go stain erasers (18) Hand sanitizer (19) Wrinkle release spray (20) Mini sewing kit (21) Travel sized deodorant (22) Nail file (23) Eyedrops (24) Tweezers (25) Mini toothbrush (26) Toothpaste (27) Hair comb (28) Tums (29) Clean & Clear oil absorbing sheets (30) Clear nail polish. I can’t wait to see my friends say “I do” this weekend, and hopefully this jar of emergency items will help fix any last minute snags that might arise. If not, there’s always whiskey. 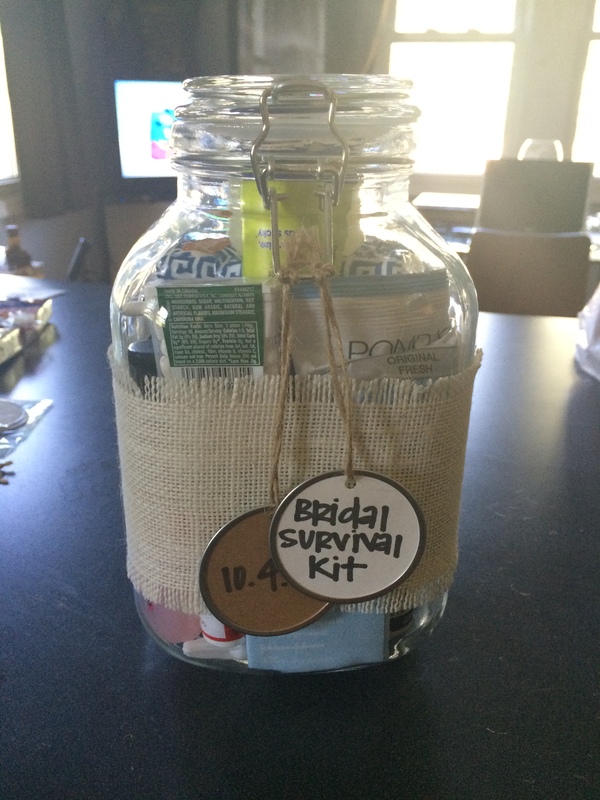 Tags: bridal survival, bride, emergency kit, getting hitched, indiana, story, wedding. Bookmark the permalink.